Heated stone therapy is nothing new in the massage world. Hot stones and heated Himalayan salt stones have been a popular practice for many years. 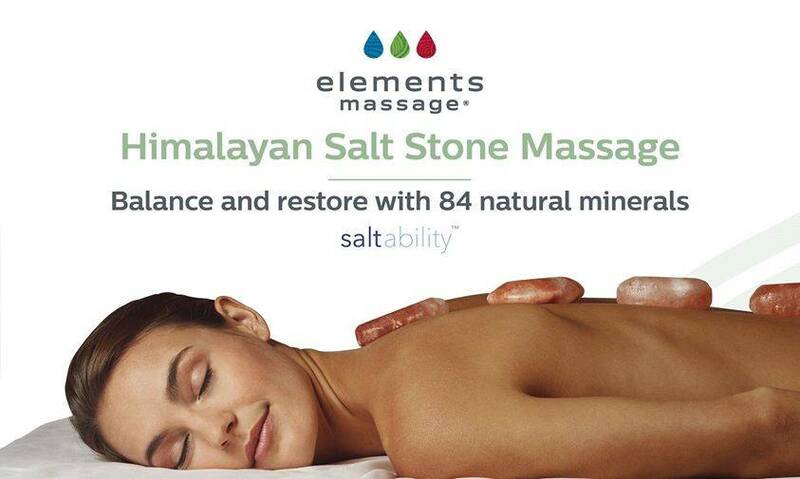 As you may know, Elements Massage added Himalayan salt stones into their choice of therapy upgrades. The benefits to these two massage therapies are endless, not to mention how relaxing the session is. However, we know you will want to know more about how hot stone therapies can have such a advantageous impact on your heath, rather than just their relaxing benefits. Moving into February, we will be promoting our heated stone therapies so you can « heat up » your Valentines Day this year. We are going to lay out all the amazing benefits of this massage service and why it is the perfect additional gift for the holiday of love. Hot stone massage are meant to relax and ease tense muscles as well as soft tissues throughout your body. The smooth, flat, heated stones are placed in specific areas all over your body depending on your needs or concerns. These areas can include your spine, stomach, chest, face, palms, feet, and toes. The traditional hot stones are made of basalt, a material that retains heat. The stones can also be used with regular Swedish massage techniques such as long strokes, kneading, or circular movements. One of the main benefits of hot stone massage therapy is decreasing overall muscle tension and pain. The stones can help increase blood flow and circulation in certain areas and can reduce muscle spasms and increase flexibility. Additionally, heated therapies are good for reducing stress and anxiety in the same way a traditional massage can. Hot stones can also promote sleep and also encourage a more restorative sleep. Another great aspect of hot stone massages is that it can help relieve symptoms of autoimmune diseases. It has been found that hot stone therapy aids in relieving painful conditions such as fibromyalgia and rheumatoid arthritis. Studies were conducted on patients with these conditions and results found immense improvements in pain relief, movement, trigger points, and grip strength. In addition to assisting with autoimmune diseases, it can help decrease cancer symptoms. For cancer patients, massage therapy was a big contributor in decreasing fatigue, pain, and anxiety. Overall, hot stone massage therapy also calms your nerves and can stimulate optimum function of your nervous system. Along with the hot stone massage therapy is the Himalayan Salt Stone Massage. This technique uses warm salt stones to help the body’s overall function. These stones are taken from the Himalayan mountains and hand carved into massage stones to help you de-stress, reduce pain and tension, and help you relax. Many of the benefits of Hot Stone massage therapy and Heated Himalayan Salt Stone therapy are very similar or even the same. In addition to providing a relaxing session, it can help improve sleep, nervous system disorders, autoimmune disorders, reduce inflammation and pain, and also improve an overall sense of well being. While the benefits are similar, there are still differences between the two types of stones. Himalayan Salt Stones provide a gentle exfoliation that regular hot stones do not. This will leave your skin feeling smooth as ever after your session. Also, Himalayan Salt Stones and their 84 naturally occurring minerals give off negative ions; this means that it greatly aids in the reduction of inflammation. Inflammation occurs when there are too many positive ions in the body, and by providing your body with negative ions through the salt stones, you can rid your body of inflammation and toxins. Overall, both Hot Stone Massage and Heated Himalayan Salt Stone therapies have countless benefits that are perfect for anyone, whatever their concerns may be. It is a great way to branch out from the traditional Swedish or deep tissue massage and see what other benefits your body can experience. Giving this upgrade as a gift for Valentines Day is the perfect way to test it out. While this service is always available, this is the perfect time to experience it and give your loved one a special session.